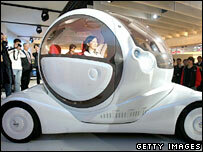 Japanese carmaker Nissan has unveiled new technology designed to detect whether a driver has been drinking. It includes odour sensors that monitor breath, detectors which analyse perspiration of the palms, and a camera that checks alertness by eye scan. If the system thinks a driver has drunk too much, the car will not start. Nissan, Japan's third-largest carmaker, says the technology is still being developed, but it will eventually be introduced to reduce road deaths. The firm says it has no specific timetable, but it aims to cut the number of fatalities involving its vehicles to half the 1995 levels by 2015. Nissan general manager Kazuhiro Doi said the sensitivity of the technology still needed to be worked out. "If you drink one beer, it's going to register, so we need to study what's the appropriate level for the system to activate," he told Reuters news agency.